Are you plagued with poor results on the turf when failure was unheard of on the driving range? Don’t be flabbergasted; this lack of consistency in one’s game can be easily overcome by using the right and well placed and well -adjusted tee. The correct height, flexibility, and resistance offered by the tee can significantly transform your game. Most of the modern tees have a concave top to support the ball. They are usually made of wood and plastic. But do you know which is the best golf tee that professionals use; what are the features that differentiate the good from the better and the best? Is it true that you can lower your scores if you use the right tee? For all these queries you will find answers in this article as we review six of the most popular golf tees in the market. Towards the end go through the buying guide to understand the basic features of a golf tee that make it so special and powerful. If you are conscious about the environment and believe in doing your bit in saving the planet then you will be glad to know that now even your golf tee can be biodegradable. Yes, among the top efficient tees used is the Champ Zarma Flytees which incidentally is biodegradable. This tee is also one of the more durable tees despite being biodegradable in nature. What is special about these tees is the 6 prong head. When the ball is stable and it has an air cushion beneath it, you will be rewarded with less friction and better strike to produce accurate drives that are straight and long. Often due to poor quality tees, you blame your swing and your clubs for devastating scores while the tee sits mutely on the ground. The material and the reinforced shank make these tees some of the most durable products in the golf world. They are so strong that they can weather the winter cold without breaking. They last five times longer than wooden tees. They are also used in major tours. White is boring and common. But when you want some extra color in your game, introduce these neon mixed tees which are distinguishable on the grass. If your aim is Par 3 this ZFT our hybrid pack of tees might be able to help you achieve your goal. Featuring the patented zero friction design where the crown has 3 prongs design where the ball and the tee contact with each other only in three places, unlike the regular tee. As a result, there is air beneath the ball and resistance is minimal once you strike the ball. This reduction in resistance or friction leads to greater accuracy and longer coverage. Do not let the height of the tee worry you because even when ¾ of the tee goes underground you will still have two inches above ground which will give you the sufficient resistance needed to drive the ball far and high with the largest driver without any incident. Probably one of the longest serving tees are the zero friction tees which just refuse to break. The sturdy construction and bio composite material combination have produced a product that will last. The resistance produced for the ball is not enough. It is not necessary that all tees you buy should be durable and last your entire lifetime. It is practically not possible. The Pride Professional Tee System’s Pro length Plus tee is no exception to this rule. These are very basic wooden tees economically priced. What makes this pride professional tee system’s pro length plus tees special is that they are manufactured to improve the launch angle and height of the ball. It has been proven that when you strike the balls using these tees the improvement in height and distance is significant. And the goodness doesn’t end there, you have the bonus of accuracy thrown in as well. How is this feat achievable? When you achieve consistency in your shots accuracy is bound to follow. These tees allow you to control your tee height; the blue lines on the white tee are indicators that guide you to dig to the required height. Unlike the other tees where it is difficult to keep track of the height, these tees make the process simple. By consistent practice at the same tee height each time you can achieve greater accuracy and better launch whereby you can cross all the obstacles and trees on the way. Sometimes even the best tees find it hard to dig the hard surfaces but this Pride Professional Tee system’s Pro Length tees can do this task quite effortlessly. The blue indicator on the tee will aid you; each time you can dig to the same height to maintain consistency which in turn will lead to better accuracy and greater distance. Like all wooden tees, these tees also break easily. While economically it is okay environmentally we can’t say the same thing. Every year several hundred trees are felled to manufacture wooden golf tees. That is a colossal damage to the earth’s eco system and we have to wake up and take charge. Maybe the makers can look at more durable options. They are some of the most inexpensive tees around. Not all pieces are same. Some of them have uneven crowns. 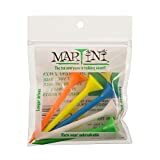 If durability is what you are looking for in a tee, then the Martini Golf plastic tees are the best bet. Made in the USA these tees are used legally in tournaments that follow USGA rules. Suited for large drivers, this 3 ¼ inch tee can be used again and again. Good quality tees like Martini are built to last and be reused. Made from polymer resin blend these tees are much stronger than the regular wooden tees or the low quality plastic tees which break at the drop of a hat. Not only are these tees sturdy but are designed to contribute to the game also. You can achieve longer and straighter drives when the ball placed on these tees. If you are expecting accuracy also from your tee, the martini will offer you that also. This tee will improve your accuracy far more than other tees. The tee is so designed that the ball, when placed on it, is tilted at an angle making it easier to strike with minimum resistance. With age, people tend to develop weakness in their limbs and hands but that should not stop the, from enjoying their golf. The martini design offers the required resistance and nothing more thereby making it very convenient for seniors and those suffering from shaky and unsteady hands to not only drive but drive accurately and longer distances too. ​This pack of five has five different colors that are vibrant and bright. These tees are easily visible on the green where normally tees are not really distinguishable. ​What also makes these tees special is their length. It is highly advantageous to have long tees because you can adjust the height to your liking – you can let them remain tall or dig in deep to reduce the length. This ability to adjust the length also gives you the freedom to use a variety of golf clubs. ​Wait, this interesting tee has a few drawbacks too that must be considered before you decide to buy it. Firstly, its biggest drawback is the diameter of the tee which is way too big; it is difficult to fit this tee in the carts holder. Despite claims of un-breakability, these tees are not the invincible. They last very long thereby helping the environment also as lesser trees need to be cut. Large diameter making it difficult to fit it in the golf cart. Probably one of the top golf tees on this list, the Versa Golf Premium Bamboo Tees are almost seven times stronger than the traditional wooden tees. They are more flexible and resilient. What would you do if you are offered premium long-lasting tees at a discount; obviously grab it. Usually, sturdy tees take some effort to dig into the ground but not with these bamboo tees which are fairly easy to place. Their lightweight nature is another feature that misleads people about their ability to perform. They are made from willowy bamboo which bends but retains its shape soon after. Similarly, these tees are immensely flexible and not easily broken. While these tees are easy to use, they will not contribute in any fashion to improving your game. They are a very basic model of the tee and just give the required elevation. If you want more from your tee look elsewhere. They are much stronger than wood like bamboo normally is. The name says it all in this case, as the 4 yard more reduced friction is a 6 pronged tee that promises to reduce friction. Built sturdily with a combination of materials like the polymer for a strong stake and the elastomer crown on top. You can reuse these tees. They are available in 2 ¾ inches,3 ¼ inches, and 4 inches. The crown is 6 pronged giving better support to the ball, provides a better contact with the ball while reducing the resistance. As a result, when you strike the ball, it flies far in a straight line. Better contact automatically reduces the ball spin. Should you be displaced with the quality of the product reach out to the manufacturers and take your money back. One of the banes of a golfer’s life is to deal with the ball spin which often results in mishots and bad scores. This 4 yards more reduced friction golf tee is ideal for those looking for relief from the spin issues. As it maximizes control, the chances of ball spinning minimize resulting in better and cleaner shots. While this multi material constructed tee reduces friction and is durable it is not counted among the best flexible tees. It is not easy to drive them into the ground either. There is lesser friction and reduced spin resulting in longer and straighter drives. The length of the tee is not very favorable. The tees once pushed into the ground are not easily visible. Extra effort is required to push them into the ground. They are small but they are not insignificant but sadly golf tees are never given their due. Ask the greatest of the players and they will tell you all the benefits of using a tee. A golf tee keeps the ball elevated at a certain height for the golfer to strike the ball more easily than when placed on the ground. 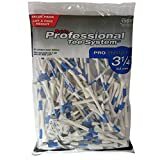 Because it is last on the priority list of most golfers you may not have sufficient knowledge or information on how to select the best golf tees. ​There is a plethora of choice but choosing the best is not so easy. In this guide, we attempt to inform you on the different kinds of tees and what are the key features that you must look for while buying golf tees. 4 inches- suitable for bigger drivers. It can be cumbersome and confusing to have several tees. Hence, the common practice is to have one tee that is multi purpose. Choosing midrange often solves the problem as their height can be adjusted – can be stuck deeper in the ground if you are using hybrids or just keep it at normal height for drivers. Taking 4 inches, the biggest tee is not very suitable for most players as it is very difficult to push it deep into the ground when you require lesser height. How does height affect your performance? Too short a tee leads to shorter tee shots while too high a tee the ball goes higher and not far as desired. ​Traditionally golf tees have always been made with wood and plastic but nowadays biodegradable tees are also available. which degrade within a year of use and enrich the golf course. These tees are strong, resilient and can be firmly placed on the ground. They do not bend or break easily. They are cheaper than plastic tees. The few drawbacks with these products are that the natural colored ones are hard to locate on the golf course, while the colored ones bleed some color into your golf clubs and finally in dry climates, these tees break rather quickly. Plastic tees: These tees are more in vogue now because they do not vary much from wooden tees in performance but they are inexpensive and more durable. But they tend to bend more and need extra effort to be pushed into the ground and are more expensive than their wooden counterparts. Biodegradable tees: Made from material that disintegrates after a year of active use within causing any harm to the environment, these tees are gaining popularity. They last longer than wooden tees but their performance is similar to that of the wooden tees. ​The latest tees come in various styles which are supposed to enhance the ball flight by offering minimal resistant and those that offer consistent height. You choose from the below styles one that suits your needs. Traditional wooden tees: They are more flexible and resilient. Brush golf tees: They are used for straighter and longer drives. They are made from synthetic fibers whose nature is to bend on contact thereby allowing the ball to rise with minimum friction. Zero friction tees: The most talked about and sought about tees, the zero friction tees provide minimum friction which not only helps in ball flight but also aids in attaining more accurate shots. You can also achieve more distance at better speeds. Stringed tees: These tees are designed to be used in all kinds of weather conditions, even on turfs covered by ice. ​And finally, if you want your own signature style tees you can get them from specialty dealers who monogram whatever name, design or logo you want on the tee. While these maybe a little overboard for a player who just wants to focus on the game, they form ideal gifts to golf lovers. ​This section is mainly for those who are not aware of golf tee regulations. Tees are normally used for the first stroke in the teeing ground and nowhere else. The only other place is the par 3 hole where if you desire you can use the tee. You need not spend as much time on selecting a tee as you would on choosing a golf club, but you still need to narrow down on the right tee to improve your game. Choose a tee which appeals to your sense of style, color, and a budget. The other factor is durability. Much as it may be tempting to go for zero friction or other more advanced tees, pause a minute and ask yourself if it worth the expense and if at your level you need it. Your answer will lead you the best golf tee you can buy.